Join Jack Jones, Chief Risk Scientist for RiskLens and creator of the FAIR model for cyber and technology risk quantification, and more RiskLens executives, for a series of lunch conversations we’re hosting across the U.S. for CISOs, CIROs and senior business executives to answer your questions on how quantified cyber risk management can reshape your organization’s approach to enterprise security. The series kicked off in Washington, DC, Tuesday, April 9, with lunch and a discussion led by Jack Jones and Mike Radigan, Director, OT Strategy at Capgemini Cyber, Inc., a pioneer of FAIR based risk assessments and cyber risk quantification within Industrial Control System (ICS) cyber security. They were joined by a high-level federal infosecurity executive. Communicate to the Board and senior management about cyber and technology risk in financial terms. Prioritize strategic investments and budgeting for cybersecurity based on ROI. Comply with growing demands from regulators for disclosure of cybersecurity risk in financial terms. You’ll also have the opportunity to network with a select group of CISOs and other IT, information security and risk management executives and officials from your local area. 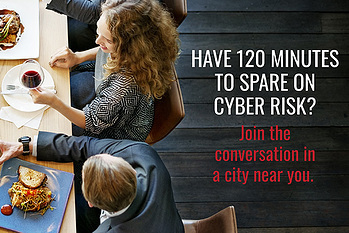 Join us for national conversation on the future of information risk management. Visit the events page for the lunch series The Business of Cyber Risk: Quantifying and Managing Risk in Financial Terms– we’ll be adding more cities to the tour soon.